This weekend we had a tasting for a wedding we are catering at The Secret Garden, Burwash Manor on the 2nd August 2014. To start they are having beetroot cured salmon with fennel salad, beetroot and horseradish jelly, and cucumber and elderflower dressing. For the main they are having roast tenderloin and pressed belly pork with crackling, potato fondant, jus and a panache of seasonal vegetables with mint butter. 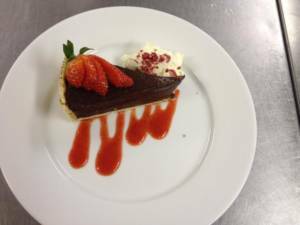 To follow they are going to have chocolate tart with a raspberry crisp, coulis and fresh raspberries. We think this is a perfect menu!